That design you've been building is just about ready, and pretty soon you'll be taking it live and showing it to the world. It's an exciting moment for business owners, but making sure your ducks are in a row before you hit the ultimate "publish" button can make for a more powerful splash. In this post we'll be talking about the things to keep in mind just before you go live and just after you've launched. You can always fix SEO errors on an existing site, but then it takes time for search engines to re-crawl your pages and update their index. And all the time the errors existed while the site was up was a missed opportunity to have ranked better — momentum that could have been. Whenever possible then, we want to launch with a strong foundation so that everything that comes after grows quickly. If you need help using an SEO plugin to optimize your pages and meta data, view our DIY SEO Guide, part 2. That explains the on-page elements and how to craft meta titles and descriptions. Otherwise, assuming you're familiar with doing that, make sure that every page of your site has complete meta data. Ideally you'd have optimized the page content also, but at a minimum you need the meta data. Incomplete meta data can ding your site in the rankings, and when search engines pull info from the content to display in its place it can display oddly. What are the page titles/what are your pages about? Internal links are crucial in creating link silos, which is a powerful SEO tactic for improving authority on your main topics/services and establishing that hierarchy. Refer to that link for a walkthrough of creating link silos, but the basic concept is that being strategic with the way supporting topics link to each other and "main" topics makes a difference in how search engines see your site. Also make sure your URL structure is at least set to use page names. (In WordPress, this is under Settings->Permalinks.) You don't want something like your-domain.com/p63. At minimum you want to to read like your-domain.com/page-title/. You can also use setups that include categories or dates in the URL. Make sure to set this to whatever you'll want long term here, before URLs are indexed. Once they are indexed, if you change them you'll either lose clout to 404 errors or have to tediously create a bunch of 301 redirects. This is not only time consuming, but redirected pages have slightly less clout. It gives search engines a complete list of all indexable URLs on your site to ensure crawlers see every page. It shows how pages relate to each other and what your main topics are. With Yoast the URL ends in "/sitemap-index.xml" instead. That's the main exception. Having the sitemap prepared before your site launches helps in the off chance any crawlers see your site before the next steps we'll talk about. But it's also useful simply because one of the very next steps is using those sitemaps. Whichever you use, it's a good idea to connect it to your site right away after it launches. That way you won't miss any traffic and you'll begin building useful data you'll use later. In the case of Google and Bing Webmaster Tools, you can check the indexing status of your content, where you're at for various keywords, and most importantly, can submit sitemaps and direct URLs. 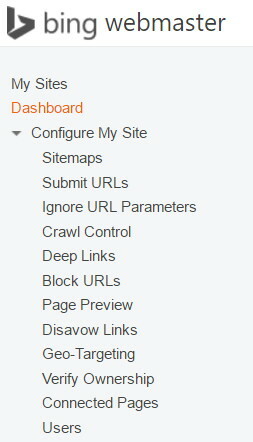 In Bing Webmaster Tools, you can find this option under "Configure My Site" on the left hand side. You'll then click on "Sitemaps". See below. 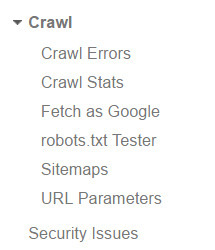 In Google Webmaster Tools, you'll find this option under "Crawl", then "Sitemaps". See below. Either site will then ask for the sitemap's URL, which we acquired in the last step. You can periodically tell Webmaster Tools to resubmit the sitemap, which will instruct the search engine to take another look at your overall list of URLs. However, Google in particular will do this on its own. If you're a new site, this is a strong way to enter the scene. If you've recently redesigned or heavily modified an existing site, this will help search engines observe the new setup and content and re-index it accordingly. If you have Facebook pages etc. for your business, you'll want to make sure all of them include your new URL if they don't already. It doesn't hurt to announce your site's launch either; invite people to check it out and share their thoughts. To get your site's content out there even faster than the influence of the sitemaps, you can also use tools like GooglePing to quickly notify various indexing and curating sites of your website's existence.